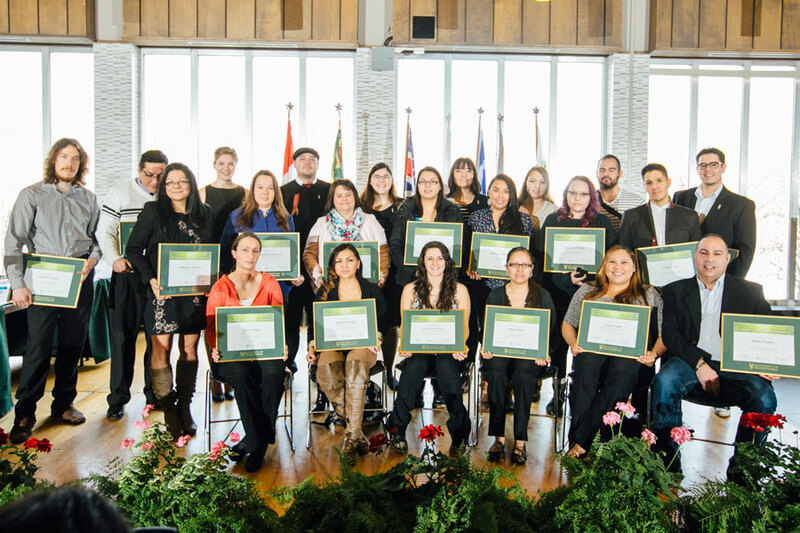 The Aboriginal Students’ Centre hosted a student awards ceremony Feb. 5 to acknowledge the accomplishments of Aboriginal students across campus during Aboriginal Achievement Week. Outstanding students from each college were recognized for having excelled at their studies, conducted unique and compelling research, showed leadership or made significant contributions to the community. U of S Chancellor Blaine Favel provided the keynote address. Candace Wasacase-Lafferty, director of Aboriginal initiatives, and Terri Favel, past president of the Indigenous Students' Council, emceed the event. Patti MacDougal, vice-provost of teaching and learning, and David Pratt, president of the Indigenous Students' Council, presented the awards. Below are the student award winners and the category of the recognition. Alfred is a first-year student at the U of S and is actively involved in his community. He sits on a number of boards, including the Ministry of Environment, Forest Branch, and Prince Albert Model Forest. For the past nine years Alfred has been working for the Beardy's and Okemasis First Nation as a Land Manager's Assistant. Braden is a third-year student in the Bachelor of Renewable Resource Management program, majoring in resource sciences. He is from Hudson Bay, Saskatchewan and is a past recipient of the Agrium Aboriginal Student Award. Avery is from the Ahtahkakoop First Nation and achieved the highest academic standing in the Aboriginal Student Achievement Program in term one of the 2014/2015 academic year. In addition to exhibiting outstanding academic performance in his first term of university, Avery is also a Huskie soccer player. Dakota is from Moosomin First Nation and is a talented and hard-working artist, and is in the Aboriginal Student Achievement Program. Dakota's responsible nature, strong work ethic and courage to explore new media, resulted in grade of exceptional high standing. Lisa is a Saulteaux woman and band member of Cote First Nation in Treaty 4 Territory. She is a fourth year student concurrently working on a B.A. in Native Studies and a B.Ed. through the SUNTEP Program. Through her work as a peer mentor, teacher's assistant, and a former academic ambassador at the Aboriginal Students' Centre, Lisa has not only supported other Indigenous students in their academic pursuits, but has also learned a lot about herself. Lisa hopes to complete a master's degree and to continue her work with Indigenous people and communities. The Aboriginal Student Achievement Program Learning Communities' Peer Mentors are volunteer upper-year Aboriginal students who facilitate sessions on study skills, goal setting and stress management. The ASAP Peer Mentors play a very important role in supporting first-year students. They share experiences, connect students to support services, and organize information sessions and cultural events. Ashley is a fourth year student in the Indian Teacher Education Program in the College of Education, and is from the Beardy's and Okemasis First Nation. Ashley is receiving this award for the outstanding job she did during a four-month internship at Fairhaven Elementary school in Saskatoon. Samson is originally from Regina and moved to Saskatoon hoping to play for the Huskie Men's Basketball team. After playing five seasons with the Huskies, Samson graduated with a degree from the College of Kinesiology. Motivated to become a teacher and coach, Samson applied and was accepted into the Saskatchewan Urban Native Teacher Education Program. Samson looks forward to having his own classroom and will continue to educate and inspire youth to set goals and reach their potential. Marsha is originally from La Loche, Saskatchewan. She received her Business Administration Diploma with Great Distinction from SIIT in May 2014. Following this, she attended the Edwards School of Business and was accepted into the Accounting major. Marsha's strong work ethic and determination will build the foundation for her to have long term success in future endeavors. Nora is originally from the Whitecap Dakota First Nation. She received her Accounting Diploma with Distinction from SIIT in May 2013. Following this, she attended the Edwards School of Business and was accepted into the Accounting major in 2014. Nora works diligently to ensure that she fully understands her course work and is happy to provide a helping hand when needed by her peers. Connor was born and raised in Saskatoon. At a young age he was taught to never take the easy road, which may explain why he was interested in becoming an engineer. Connor's current career aspirations are to work with a mining company that operates in the province, and to use his leadership skills to create mutually beneficial partnerships that give back to Aboriginal communities. Jordan is a Master's student in Water Resources Engineering at the U of S and is of Métis descent. He grew up in rural Saskatchewan, and attended school in Dalmeny, Saskatchewan. Jordan has worked with high school students at James Smith Cree Nation to help explain water issues related to flooding and water treatment, and has helped at the Saskatoon Children's Festival. Jordan enjoys martial arts and yoga, and has spent several years as an assistant karate instructor. Blake is from Stanley Mission or Amachewespimawin, as it is known to Cree people. As a current student in the Master of Northern Governance and Development program, he shares and advances his knowledge of northern Indigenous issues and applies this knowledge to his work with community development. Through his education and leadership, Blake has been a long-time advocate for healthy, northern communities. Donald is from the Peter Ballantyne Cree Nation, and now lives in Saskatoon. As a two-spirited, Cree man, he has met challenges head on and shown strong leadership skills in his academic and professional pursuits. While a student in the Master of Northern Governance and Development program, he has volunteered his time with a number of initiatives. In his studies, Donald is a conscientious, pro-active student, often offering encouragement and support to other students. Lorne is in his second year of study in the JD program in the College of Law. This year, Lorne has served as the student manager at the inner city poverty law clinic, CLASSIC, which is associated with the College of Law. Under the supervision of lawyers, law students help to meet the needs of Saskatoon residents who would not otherwise have access to legal services. Lorretta is in her third year of study in the JD program in the College of Law. She has taken a leadership role in the college as the elected President of the Aboriginal Law Students Association. In this role, she has engaged Aboriginal students in discussions about legal and political issues that are of significance to Indigenous Canadians. She has also made considerable efforts to foster a collegial relationship among ALSA members and to raise awareness of the concerns of Aboriginal students. Karissa traces her roots back to Little Black Bear First Nation in Saskatchewan. Her greatest role models are her parents who worked very hard to provide for her and her siblings. Her greatest obstacle for getting into medicine was her own ability to think she was good enough as an Aboriginal person. She completed a biology degree at the University of Regina, applied to the University of Saskatchewan's College of Medicine and, much to her delight, was accepted. Karissa is very involved in promoting Aboriginal health and encouraging Aboriginal youth in to the health professions. Joshua is a Métis student who has worked very hard to gain entrance into the College of Medicine and is well on his way to completing his first year. He has volunteered numerous times at SWITCH, a student run multi-disciplinary medi-clinic on the west end. He recently spoke at Austin O'Brien High School in Edmonton, his former high school, where he encouraged Aboriginal students to pursue post-secondary studies. Joshua also volunteers with the Edmonton Christmas Bureau delivering hampers to less fortunate families. He has coached minor football teams, volunteered with Big Brother/Big Sisters, and this past year, has played his fourth season with the U of S Huskies football team. Danielle grew up in La Ronge, Saskatchewan. She graduated from Churchill Community High School and then moved to Prince Albert to take the Northern Health Science Access Program. She moved back home after a year to take the first ever nursing degree program in La Ronge. Danielle hopes to work as a public health nurse or home-care nurse to help improve the health of others. In a leadership in nursing class Ronalda, Denise, Erica and Tenneille chose to study about missing and murdered Aboriginal women and girls in Canada. Their goal was to raise awareness and create dialog regarding missing and murdered Aboriginal women and to ask Saskatoon city council to lobby the federal government to support a national inquiry. City council agreed and offered to send a recommendation to Ottawa to support this very important issue. The students are proud to have given a voice to the hundreds of women and girls who have gone missing or have been murdered over the past three decades. Their hope is that a national inquiry will offer the families of these women some form of closure and to acknowledge these women as victims, and to bring a stop to the senseless violence targeting Aboriginal women and girls in Canada. Dallas, along with two brothers, was born in North Battleford, Saskatchewan and raised by his mother. He wanted to become a Registered Dietitian after being inspired by an information session put on at the University of Saskatchewan. Dallas plans to get his degree in Nutrition, become a Registered Dietitian and to contribute to the health and well-being of his community. Kirsten is Saulteaux from Cowessess First Nation, located in Southern Saskatchewan. She was born in Edmonton but raised in Regina. Her father is a registered nurse, so at an early age was exposed to the health sciences. Kirsten received an entrance scholarship to the University of Regina and attended for two years before transferring to the University of Saskatchewan to study pharmacy. After graduating, she began a Pharmacy Residency program in the Regina Qu'Appelle Health Region.